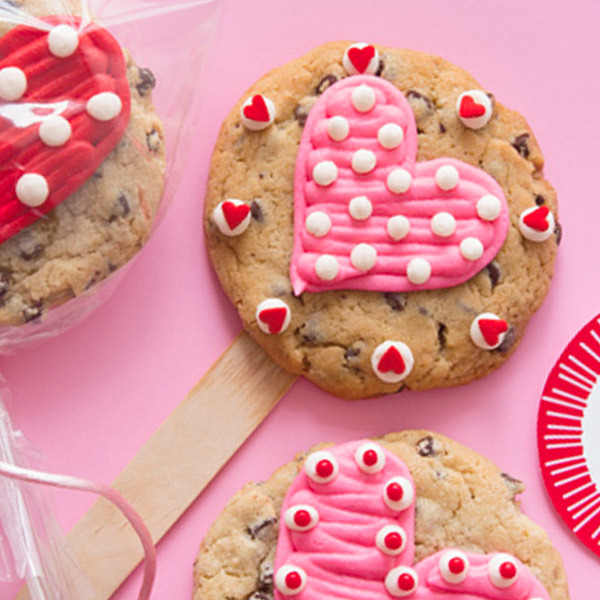 Who wouldn’t love some sweet cookie treats? Hallmark cookie expert Bernard Shondell shares his chocolate chip cookie recipe, perfect for crafting your own cookie bouquets (or just for enjoying with milk or a cup of coffee!). These easy chocolate chip cookies are chock full of chewy, gooey goodness and mini chocolate chips. Whisk together flour, baking soda and salt in a bowl. Set aside. In a separate bowl, cream together softened butter, shortening, sugar and brown sugar until mixture becomes light and fluffy, about 3 minutes. Add vanilla extract, cream de cacao (optional) and eggs, 1 at a time, to the butter mixture. Mix well. Slowly add flour mixture to the butter mixture, about ½ cup at a time, until all the flour is incorporated. Add mini chocolate chips and stir by hand to incorporate. For best results, chill dough in refrigerator for a few hours before baking. Get the instructions for Bernard’s DIY cookie bouquet.